Femke IJlstra (1982) studied saxophone with Arno Bornkamp on The Amsterdam Conservatory. In 2009 she finished her master degree with distinction. Femke plays on a regularly basis with leading orchestras including the Royal Concertgebouw Orchestra, Budapest Festival Orchestra and the Toronto Symphony Orchestra. She also plays in Anima Eterna, a Belgian orchestra that is specialized in period instrument performance. In 2016 she won the audition to play saxophone in Tonhalle Orchestra in Zurich, Switzerland. As a soloist, Femke plays with many different orchestras. She made many radio recordings and appeared on Dutch television. She is also a regular guest in various music festivals. Next to her activities as a soloist, Femke loves chamber music: besides playing in Syrène Saxophone Quartet she plays soprano saxophone in the renowned Aurelia Saxophone Quartet and has a duo with percussion, MUSU. They performed in Amsterdam, The Hague as well in St. Petersburg, Paris and Berlin. In September 2012 she record her first CD together with poems and artwork in a book called Stofsugersjongers. On this CD she plays music from M. A. Turnage, and new pieces written for her. Femke is saxophone professor at the Hanze University of applied Science of Groningen. Annelies studied the saxophone at the Prince Claus Conservatory with Peter Stam, at the Royal College of Music in Stockholm with Christer Johnsson and at the Conservatory of Amsterdam with Arno Bornkamp. Both her Bachelor and Master degrees were finished with the highest honours. 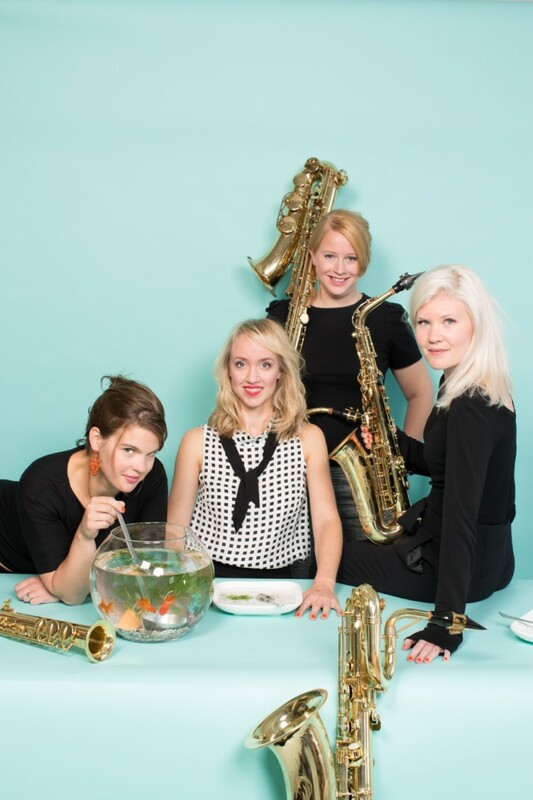 Besides playing in the Syrène Saxophone Quartet, Annelies is performing in the Rodion Trio, an unique ensemble with clarinet, saxophone and piano. Furthermore she freelancing with Dutch orchestras en ensembles, such as the Netherlands Philharmonic Orchestra, the The Hague Orchestra and Asko|Schönberg. Aukelien Kleinpenning (1987) plays a broad classical repertoire on the saxophone and often performs on stage. She enjoys collaborating with performers from a wide-range of disciplines, such as modern dance, poetry and theater. For the Bachelor’s (with honours) and Master’s degree of Music, Aukelien studied under Johan van der Linden at the Utrecht Conservatory. She attended classes given by Willem van Merwijk to specialize in the baritone saxophone. At the Konservatorium Wien Privatuniversität, she studied modern music under Lars MleKusch. In addition she has also undertaken private lessons from Arno Bornkamp. Aukelien has been invited by many ensembles and orchestras to substitute and participate in various projects, including the Marinierskapel, Doelen Ensemble, and the Rotterdam Philharmonic Orchestra. Together with the Nederlands Blazers Ensemble, she participated in the New Year Concert in Amsterdam and the BBC Proms in the Royal Albert Hall in London. Her forte in addition to the above is to perform chamber music in various ensembles, having a permanent role in both the Syrene Saxophone Quartet and the TenToon Ensemble.